When it comes to crowdfunding it is usually the record breakers that make news. The largest number of donations, the highest amount raised, etc… However, every week hundreds of small projects launch crowdfunding campaigns, and there is a lot we can learn from their successes and failures too. That’s why I was excited last fall when I began talking with journalism crowdfunding platform, Beacon, about experimenting with how to make crowdfunding work for small local news organizations. Local organizations present some unique challenges — their audience is much more limited than national publications, they often can’t tap into national interest in a niche topic, and the smallest organizations don’t have dedicated marketing or outreach staff to run the campaigns. One of our partner sites, New Brunswick Today, just successfully completed its Beacon campaign, raising $15,000 in one month. New Brunswick Today is an amazing four-year-old digital news start-up that publishes in English and Spanish and prints a monthly newspaper. The specialize in great watchdog reporting focused on local government and civic institutions and they have built up a loyal community following. As part of our journalism sustainability project, the Geraldine R. Dodge Foundation, with support from the John S. and James L. Knight Foundation, offered $5,000 in matching funds and spent $2,000 to hire Beacon staff to coach the New Brunswick Today team on managing the campaign. Prior to this campaign, many of the projects funded on Beacon covered broad topics of national concern, like climate change and net neutrality. Those issues benefit from drawing on a large base of passionate advocates and concerned citizens. However, in my interview with Catherine Hollanderof Beacon after the New Brunswick Today campaign ended, she remarked at the deep passion of local people for their local news outlet. Hollander usually encourages groups to focus their campaigns on a specific, tangible project, but New Brunswick Today focused their pitch mostly on general support of their reporting. With the funding they hoped to hire more translators and expand their use of video, but those themes were secondary to their more general appeal for support. Hollander said that the response New Brunswick Today got was a testament to the fact that they have cultivated a very loyal community. 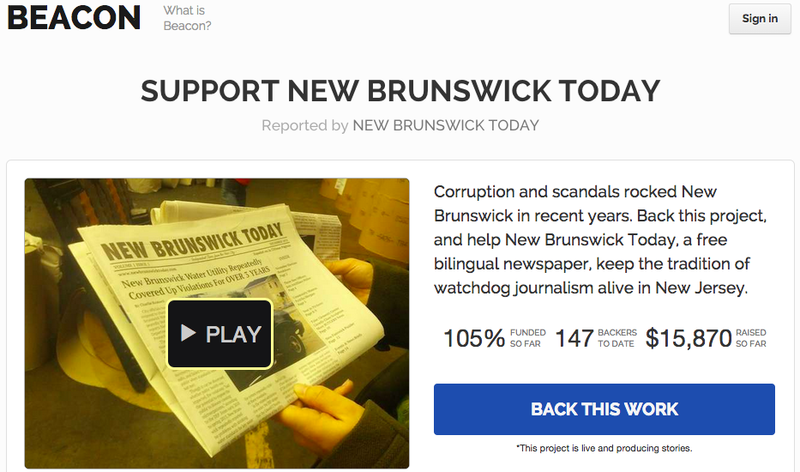 One way New Brunswick Today did weave their voice into the campaign was by doing profiles of their freelancers and contributors on Facebook as a way of keeping the crowdfunding campaign front and center. Design Your Campaign for Many Funding Levels — When we think of crowdfunding we often think of lots of little donations, but Beacon told me that New Brunswick Today had a bit more high level donations than many other campaigns. And I have seen news orgs include higher funding levels designed for local businesses too. Put Your Campaign Everywhere — New Brunswick Today had a prominent box on all their websites, with a strong call to action linking back to the crowdfunding campaign for the entire month and Beacon staff said it was one of the better performing calls to action they had seen, attributing this to its front-and-center position on the website throughout the course of the campaign. It was impossible to visit New Brunswick Today’s website without seeing it. Don’t Worry About Over Asking — Don’t be afraid to Tweet, Facebook, email your fans about the campaign often. Crowdfunding is part of our online lives today and people recognize that campaigns are short and intense. Most successful campaigns share info about the campaigns multiple times a day and send out regular emails. New Brunswick Today saw nearly zero unsubscribes from their email list due to campaign related asks. In fact, the editor there told me that people liked getting the updates about how the campaign was going — they were excited to be part of supporting something. New Brunswick Today is doing great work and their crowdfunding campaign helped them expand their reach, hone their marketing and encourage deeper investment from their community. We are about to launch our next local journalism crowdfunding experiment and we’ll have more to share soon.